Our body has inherent knowledge for recognizing what food groups and nutrients we have consumed, and what it needs to be properly satisfied. It uses the six tastes to know if we have gotten the variety needed to achieve perfect health. The body’s craving of certain foods are usually in response to doshic imbalances, in efforts to seek harmony again. When we consume all 6 tastes at meals, we feel nurtured, and are less likely to be out of balance and overconsume at the next meal in efforts to get the variety of nutrients the body needs. All food can be categorized into these six tastes. And each taste has a particular influence on the three doshas or mind-body constitutions that affect our ability to be in a state of perfect health and balance. Thus, the food we eat, and the tastes they have, affect one or more of our doshas, with each dosha balanced by three tastes. It is ideal to have all six tastes at your lunch and dinner meals, but especially at lunch because it should be the main meal of the day. What are the Six Tastes of Ayurveda? Common sources of the sweet taste in our daily diet include all sweet foods like grains (pasta, rice, bread), oils, cow milk, fatty meats, starchy vegetables (carrots), dates, and sweeteners. It is balancing to the vata and pitta doshas. Excessive intake imbalances kapha dosha. Sweet is deeply nutritive and building (for the cells and systems, living tissues, and fluids). It is the most grounding and nourishing. Its qualities are heavy, oily, and moist — which slow digestion. Common sources include table salt, sea vegetables, salty meats, processed foods (chips, pretzels), black olives, cheese, tamari, and soy sauce. It is balancing to vata, with excess imbalancing kapha and pitta. Salt is grounding and moistening, and heating. Salt stimulates digestion, helps maintain proper electrolyte balance, and has mildly laxative effects. Common sources include citrus fruits (lemons, limes, sour oranges, grapefruit) berries, tomatoes, vinegar, and fermented or pickled foods (cheese, yogurt, alcohol). It is balancing to vata, with excess imbalancing kapha and pitta. It is used to enhance digestive fire, stimulating appetite and saliva production. Its qualities are light, heating and oily. Common sources includes all green leafy vegetables, and especially dark green leafy vegetables, beets, dandelion root, tumeric, and fenugreek. It is balancing to kapha and pitta, excess may cause vata imbalance, especially raw vegetables. Bitter is the coolest and lightest of all six tastes. Its comprised of air and ether. It is best in small amounts, to enhance flavor, and help to gently purify and cleanse the body. Common sources include hot and spicy foods like peppers, chilies, garlic, also ginger, onions, and radishes, mustard. Balances kapha dosha, but excess irritates vata and pitta. It creates increased elimination and improves appetite. Its qualities are light and dry, and hot. Common sources include beans and legumes (lentils, mung), green apples and grapes, cabbage, poultry, potatoes, tea, unripe bananas, cranberries, pomegranates, alfalfa sprouts, green beans, and okra. Balances kapha and pitta doshas, excess imbalances vata. Its qualities are cool, dry and light, firm (makes your mouth pucker and feel dry). Slows down digestion. 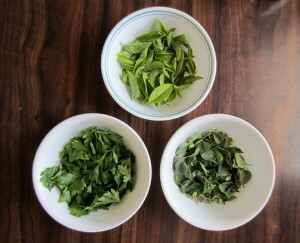 Grains (sweet), green vegetables, (bitter) beans or poultry (astringent), little bit of hot/spicy (pungent), little bit of salt (salty), and little bit of sour (sour). Meal: Kitchari with white rice (sweet) and red lentils (astringent), added Himalayan salt (salty), squeeze of lemon juice (pungent), chard (bitter), and black or cayenne pepper (pungent) and cilantro (bitter) to taste. When you have all 6 tastes at your meal, you will leave the table feeling satisfied and nurtured. In the long run, you will overeat less, and your body will be able to digest food properly at the right amounts, leading to a naturally balanced weight and reducedama or toxins. Would you like help with finding the right ayurvedic diet and meals for your mind-body (doshic) constitution? Read about our ayurveda consultations here.